Offprint from The Modern Language Review, Volume XXIII, Number 2. Covers rust marked and slightly creased. Binding string snapped. Top corners of pages creased. Good. 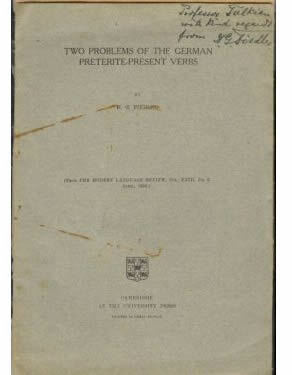 Presentation copy from the author to J.R.R. Tolkien. Inscribed: "Professor Tolkien with kind regards from H.G. Fiedler."